This is a 16-page executive summary of a national survey of more than 1,400 parents. 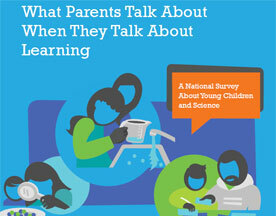 It includes easy-to-use infographics about parents' attitudes, beliefs, and practices related to early learning and science learning. The study was developed as part of the CPB-PBS Ready To Learn Initiative. This is a first of its kind study commissioned by the US Department of Education’s 'Ready to Learn Initiative' led by the Corporation for Public Broadcasting and PBS. It was conducted by EDC and SRI International, two long-standing evaluation partners of Ready to Learn.